I knew it. JOJO is number 1. It’ll probably be third in the end. Delta will be first, and Kabaneri might end up second because it’s only three volumes compared to Jojo’s thirteen. well i expect JoJo to sell at least 1k per volume. Isn’t that obvious? How can a franchise that has averaged many times higher than 1k in its previous seasons, suddenly not sell 1k per volume??? well that’s unfair. re zero vol 1 has 5 weeks, jojo only has 3 weeks. Obviusly re zero is going to have more sells. I don’t see how it’s “unfair” that Re:Zero sold better in weeks 4-5 and made the rankings in weeks where Jojo did not. They both came out in the same week. If Jojo sold more in those weeks, it’d be on the list for additional weeks too. But like I said, they came out in the same week. They’ve both been on sale for five weeks, but Re:Zero made the top 100 5 times while Jojo only did it 3 times. Not all discs add the same amount every week! When Re:Zero sold 734 BDs in wk4, Jojo sold something less than 247 (the top 100 cutoff for the week). That’s why we talk about the long tail. Some discs add more over time than others. Put it another way: Sure, Jojo did sell discs in the 4th and 5th weeks. But not enough to make the top 100 that we actually see in these reports. The threshold in its 4th week was 247 and in the 5th week was 254. In a best case scenario where it ranked #101 both weeks (incredibly unlikely, by the way!) selling 246 and 253, its total would at the absolute theoretical limit now be 9,637 – which is still slightly below Re:Zero’s 9,666. Anime doesn’t magically stop selling in 3 weeks, like you are suggesting. 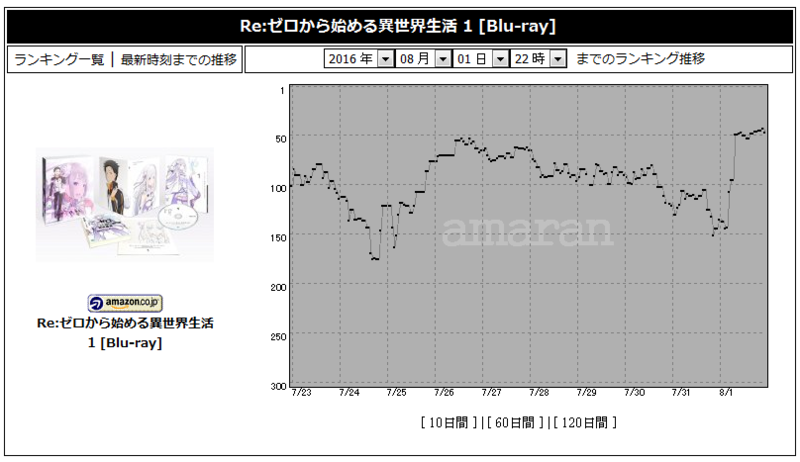 Both Re:Zero Vol.1 and JoJo Vol.1 has been on sale for 5 weeks, but it is as something said… JoJo’s sales fell under the Top 100 cut-off in weeks 4 and 5. It didn’t sell 0 discs within those weeks. So both had equal opportunities to add discs, it is just that JoJo’s week 4 and 5 sales are unknown, since it ranked in between rank 101 to 300 in the overall Top 300 weekly BD list (not only anime is in that overall BD list). I assume you didn’t take into account that Re:Zero may have had stock issues in week 1, which could explain why it started out lower than JoJo. Another thing to take into account is that some episodes can increase the sales momentum of a particular title. 1,436 week 1　→　410 week 2　→　734 week 3, this sales bump doesn’t usually happen. Yep I think at least two more weeks is a safe bet even with the extended rankings being gone. A small boost for the release of v2, and then a week or two with low thresholds bringing it back.